I find I still have a lot to learn about how to grill. I’m still living in a world where you throw the burgers on, wait till they look dark with black stripes and then throw some cheese on. Now, I’m doing steaks and pork chops and have a bigger fear that I’ll ruin a $10 piece of meat because of my ignorance. 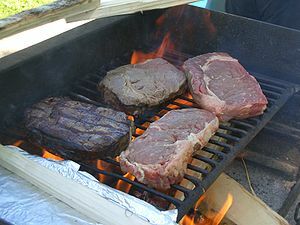 Meat and grills all seem to be very temperamental and many are in the ranks of grillers who live with ancient apparatus because they know where all the grill hot and cold spots are. What I do know how to do is follow a recipe. I volunteered to try out a new one using raisins the other day. Seems the California Raisin Board is promoting the use of raisins as a natural sweetener and sticking them in a sauce seems like a natural idea. I ran out and bought all the ingredients including tomatillos, raisins, and a can of chipotle chiles “in adobo” (whatever that is), as well as four nice pork chops for a surprise Friday night treat for my hard-working wife. Unfortunately, when I got home, a brewing work crisis called me away from the kitchen. Our babysitter had just brought the kids home, so I thought I’d enlist her to quickly put the BBQ sauce recipe together before she left. Ten minutes later she told me she was leaving and that the sauce was done and on the counter. Success! Now, all I had to do was prep some asparagus, some pasta, and a salad and the meal was done. This is where our simple grilling story takes a hot and shocking twist. As I rummaged around the kitchen for other ingredients, I noted that I found no evidence of two of the key sauce ingredients. The raisin bag was gone and so was the can of chiles. To my horror, I found the empty raisin bag AND the empty can of chiles in the trash. She had used a full pound of raisins instead of a 1 1/2 cups, but worse, had used the one whole can of chiles rather than “1-2 chiles” as the recipe required. My daughter and I tasted the sauce and both felt like those cartoon characters who go all red with smoke coming out their ears. It was inedible, at least for us softies. Emergency situations require for emergency measures. I packed the kids up and ran them to the store and we bought all the ingredients over again. However, instead of opening a new can of chiles, I just used a proportionate amount of our babysitter-made hot sauce, which still gave the recipe plenty of kick without burning our lips off. This is a good recipe for BBQ lovers. It is spicy and you can dial it up or down by adding more or fewer chipotles. It has lime for a little tang and the raisins give it sweetness without using molasses or plain sugar. It’s sweet without being sugary, a taste I don’t like in a lot of store bought sauces. Click here to find the raisin-based chipotle barbecue sauce. 1. Brown the pork chops a bit before slathering on the sauces. A few minutes on each side will do it and then keep on brushing the sauce on. Grill each side after putting on sauce. Don’t serve with ungrilled sauce on one side as I did. 2. Make sure to reserve some sauce that isn’t used as marinade to put on the cooked meat. 3. The raisin board wants you to use raisins rather than molasses or corn syrup, which many recipes use. Raisins have fiber, potassium, and anti-oxidants, which are good for you, and even 1/4 cup of raisins is considered a full serving of fruit for a child. However, a sugar is a sugar is a sugar whether it comes from an apple or a bag. At least with raisins, you get some other good stuff along with your sugar. It’s hard to tell if you really are able to even get a 1/4 cup serving on one pork chop, without really drowning the thing in sauce, but be my guest! It will make it tangy. 3. The next time I make this sauce, I’ll skip the added BBQ sauce and put some extra raisins, tomatoes and secret spices (clove, cinnamon, garlic, tamarind) in instead. You’ve already put a lot of good stuff in this sauce; why ruin it by pouring an industrial concoction into it. You certainly don’t need to add “smoke flavor” since you’re putting it on the grill!